Don't trees take care of themselves on their own? In Alaska, we're used to the natural world being pretty independent. But if you're a homeowner, the trees on your property are part of the value of your home and most people don't pay much attention to them until there's a problem, says Anchorage-based certified arborist Mike Post. That's a mistake. Well-maintained trees "can add considerable value to your home," he says. Post has spent more than decade caring for Alaska's trees as the owner of Tall Trees. He and his workers fan out across Southcentral Alaska armed with climbing equipment, chainsaws, chippers and stump grinders. The most commonly requested service? Removing trees that are unwanted, hazardous or ungainly. It doesn't have to come to that, says Post. We asked him to guide us through the world of tree doctoring. Planting trees in the wrong location is one of the most common mistakes homeowners make, says Post. When saplings are planted too close to the house, other trees or under utility lines, they grow into a big problem and often need to be professionally removed. 1) If the needle or leaf is yellowing, browning or otherwise discolored outside of normal seasonal changes. 2) Dead twigs at the end of tree limbs and at the tops of trees. 3) Funguses on the trunk or around the stump or a serious insect infestation. Many homeowners either don't know how to prune or don't prune their trees at all, says Post. These can be equally damaging. "There's a science behind cuts that allows the tree to properly heal," says Post. "If cuts aren't made the right way the tree cannot heal that wound and decay will set in." This can eventually cause the cavity of the tree to become a hazard. If you're not sure how to do it, call an arborist. Think of pruning as brushing your tree's teeth. 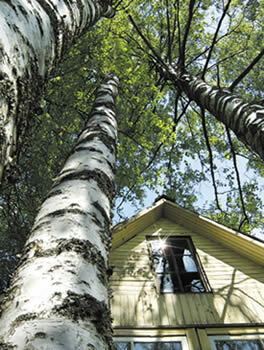 Native trees like birch and aspen are healthier when pruned once every 3-5 years. Ornamental trees, like mountain ash and lilac, should be pruned more regularly – once every 2-4 years. Under-watering trees can be a problem. "Trees need a slow soak over an extended period of time," says Post. Soil absorbs moisture slowly, so soaker hoses work best to hydrate trees. Sprinkler systems saturate the first inch or two under the soil, but the rest of the water runs off. The best thing homeowners can do on their own is start a watering schedule – separate from watering lawns or other plants – that consists of a "slow soak over a 4-6 hour time period 2-3 days per week," according to Post. In the past, spruce beetle infestation has been a major tree-killer in southcentral and interior Alaska. In 1996 alone, more than 1 million acres in the state were infested. While that problem has faded in recent years, birch aphids and leaf miners are still a big problem for area homeowners. Arborists can perform "soil injections" that help to get pests under control.